I’ve been trying to think about what I wanted to do with the tenderloins from the deer I shot last Thanksgiving. They are a first for me, both to cook and to eat. I finally decided to go with the KISS method…Keep It Simple Stupid, and I’m glad I did. 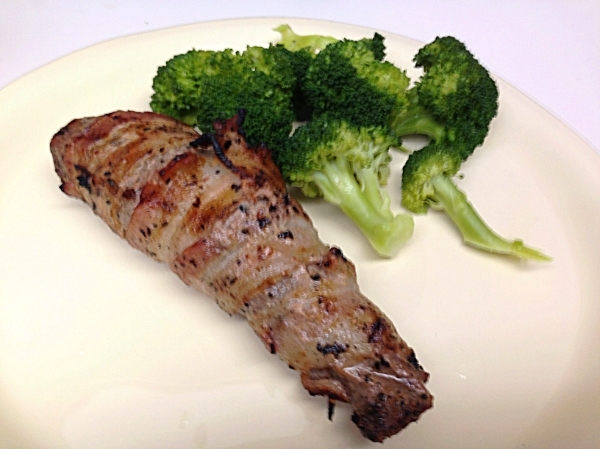 For those not familiar with deer, the tenderloins are pretty small. These were smaller than the pork tenderloins you would normally pick up at the grocery store. The two of them were just enough for Mrs. G and I. Before getting started, I trimmed them of all the fat (that’s where the “gaminess” is) and the silver skin. 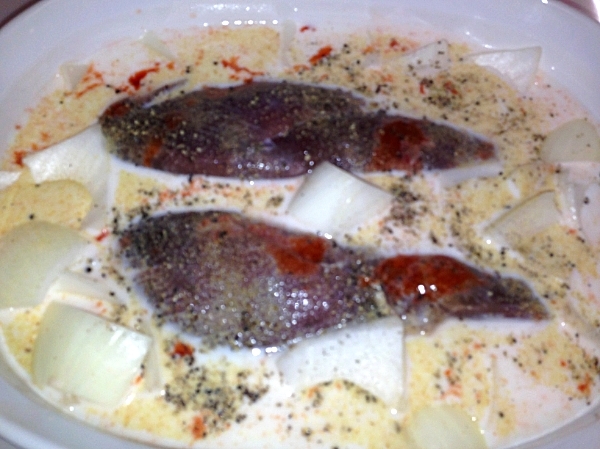 I then soaked them in a bath of milk (my Father-In-Law said it helps draw out the blood and tenderizes it), some hot sauce, a bit of rough chopped onion, garlic powder and some fresh cracked black pepper for about 45 minutes. I would have like to let them marinate longer, but didn’t have the time. After 45 minutes, we removed them from the marinade and rinsed and dried them off. Then, we sprinkled on some salt, pepper and garlic powder. 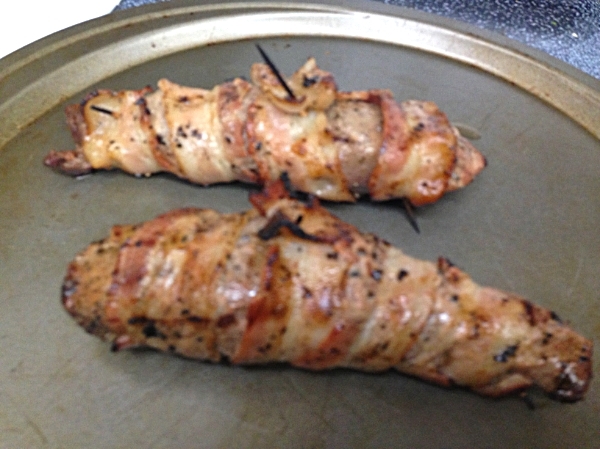 Next, we par-cooked four slices of bacon in the microwave for about a minute and a half (should have done two minutes) and then wrapped each tenderloin with two slices. 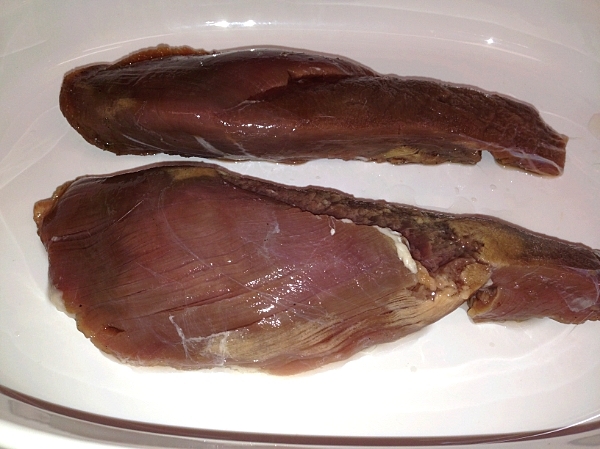 The tenderloins were then placed on the Egg which was heated to medium-high (I’m not exactly sure on the temperature. I think my dome thermometer is off and needs to be recalibrated. I just went by feel). 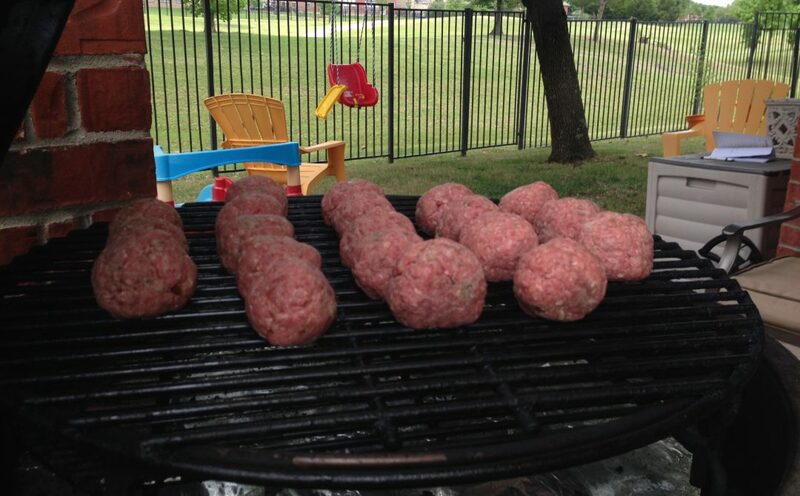 We used less than a handful of mesquite chips just to add a hint of smoke flavor. We cooked them for about 12 minutes, turning every so often to crisp up the bacon and pulled them when the internal temperature had reached 125. All my research online had shown that going much higher would ruin the cut of meat and make it very tough. After pulling, we let it rest for, loosely tented with aluminum foil, for five minutes. Removed from the grill and resting before eating. I really have no idea what is going on with my camera, but please excuse the blurry pics. For some reason last night it did not want to focus. Trust me, I tried. I must have taken at least 10 pictures and they all came out bad. I know you’ll let is slide this one time…right? If I had the chance, I’d do the cook again and hopefully get better pictures, but you only get two tenderloins per deer and that’s all I have until next season. Plated up with some broccoli. Kept the sides simple with just some broccoli and a salad, but this was an impressive dinner. I’d be hard pressed to compare it to a beef tenderloin or a pork tenderloin. Sure, it comes from the same general area on the animal, but the taste was something else. It wasn’t “gamey” at all and the bacon and mesquite complimented it perfectly. 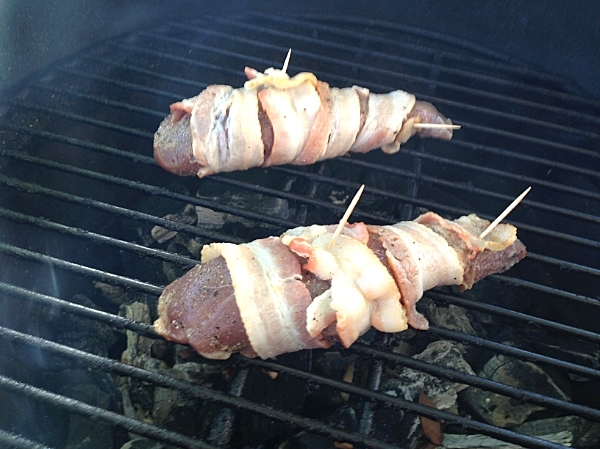 Just a hint of salt and smoke from the bacon and a light kiss of smoke from the mesquite helped to enhance the flavor of the venison. And talk about tender? It was so tender, it just melted in the mouth. I’ll take a venison tenderloin over a beef or pork one any day. I know most of you out there don’t have access to venison, but if somebody ever offers you any, take them up on the offer. You won’t regret it. Looks really delicious! My ex-father in law hunted every year, and my ex-mother in law was an excellent cook. 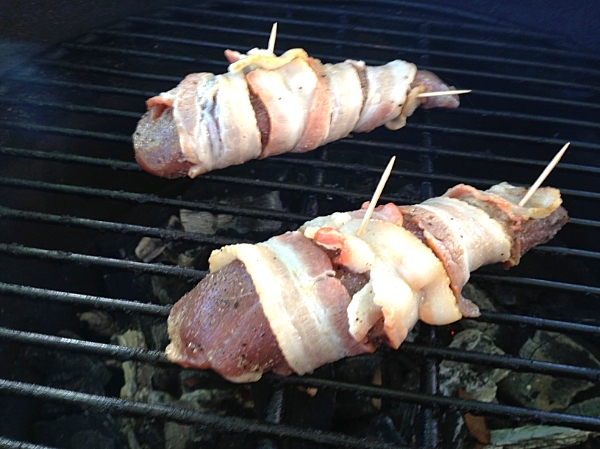 I’ve had venison just about every way possible, but never smoked or wrapped in bacon. Yum! Check your auto/manual focus switch or setting. I’ve turned it to manual before and then ruined a good 12 pictures before realizing that auto focus was turned off. Bambi…errrr…the venison looks great. The first venison I ever had was DEEEELICIOUS and the next few times it was awful. Taught me a lot about proper kill and dressing before I ever went hunting for the first time. I hate gamey venison, looks like you handled it well to prevent that. Got it all fixed up. I had messed with some of the settings and forgot to switch them back. Like you said, it all comes down to the kill and the dressing. My brother in law stood next to me and told me what to do step by step. This looks simple and delicious! Thanks for sharing! Just discovered your blog and though I should reach out.